This is a photograph showing the Blunderfield family. 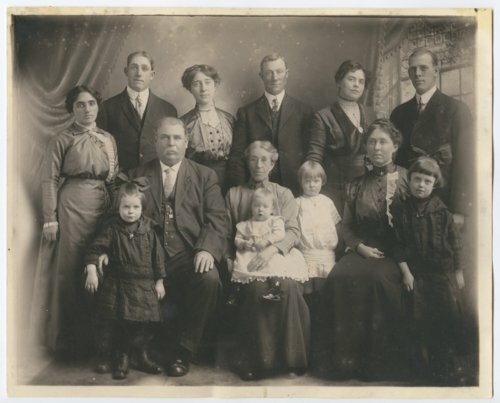 People in the photograph are: (left to right) first row seated: William Henry Blunderfield, Martha Lewis Blunderfield, and Mary Elizabeth Blunderfield; children in front: standing Irene, Ruth and Faye, daughters of William Phillip and Margaret Blunderfield and seated on Martha's lap is Mildred Mae Jolitz, daughter of William an Mary Blunderfield Jolitz; second row standing (left to right) Maude Hobbs Blunderfield, daughter-in-law, wife of Frederick Blunderfield, Frederick John Blunderfield, Emily Alice Blunderfield (wife-to-be of Leslie Ayres), William Frederick Jolitz (son-in-law and husband of Mary Blunderfield), Margaret Blunderfield (daughter-in-law, wife of William Philip Blunderfield), and William Philip Blunderfield. William Henry Blunderfield and his wife Martha (Govey Lewis) Blunderfield settled on a homestead west of Talmage, Kansas and north of Solomon. Will farmed and worked as a blacksmith to make ends meet. Later, he acquired two additional farms, and when he retired, he moved to Talmage. After Martha's death in 1918, William traveled to France and England. While in England he vivisted martha's family including the dauther of Martha's eldest sister. Elizabeth Mathews was ten years younger than Will, but she agreed to become his second wife and move to Kansas. They were married on October 6, 1920, in the Primitive Methodist Church in Ealing, England. William and Elizabeth moved from Talmage to Salina where he lived until his death on died December 11, 1927. Soon after his death, Elizabeth moved back to England where she died in 1937.